the babycloset: What does the Baby Closet need for April? What does the Baby Closet need for April? March was another blessed month, thank you so much to those of you who continue to give donations, your time, your creative ideas, nothing is too small in God's eyes and what a blessing to see this ministry flourish because of Christ and His people having such a servant's heart. 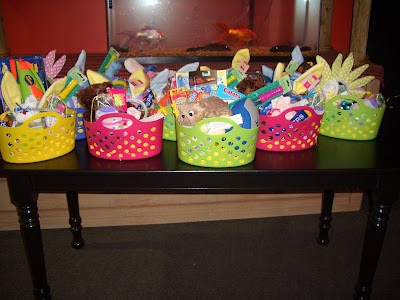 A woman from the church made all these fun Easter baskets for all the moms/kids and what a sweet thing to do...I think we were just as blessed by this act of kindness as the moms were! We are always looking for more volunteers so if you want to get involved, email Brooke Cooke and she can give you a list of ways we are in need of your help. Thanks again to all who have helped, it is a blessing to be His hands and feet!